NASA scientists were startled when a recent exploratory mission revealed a huge and rapidly-growing cavity on the underside of one of Antarctica’s glaciers—signaling that the ice mass has been melting much faster than experts realized. The cavity is two-thirds the size of Manhattan—large enough to have contained about 14 billion tons of ice before it melted, according to a report that was published in Science Advances on Thursday. Much of that ice disappeared at an “explosive rate,” scientists reported—likely melting only in the last three years. The agency’s Jet Propulsion Laboratory used ice-penetrating radar to explore the area beneath the Thwaites Glacier in West Antarctica, often called “one of the world’s most dangerous glaciers” because its melting could significantly contribute to sea level rise. Scientists expected to find some relatively small gaps between the glacier and bedrock, but were unsettled by the 1,000-foot deep cavity the mission revealed. As Common Dreams has reported, the study follows numerous recent scientific reports showing that ice in Antarctica is melting at a much faster rate than previously thought—as oceans warm more rapidly as well. The melting of the Thwaites Glacier, which is the approximately the size of Florida, is already behind about four percent of global sea rise, according to the Jet Propulsion Laboratory. The disappearance of the ice mass would cause sea levels to rise by about two feet as well as making surrounding glaciers more likely to melt rapidly—which could cause an eight foot rise. If this mysterious glacier were to “go bad”—glaciologist-­speak for the process by which a glacier breaks down into icebergs and eventually collapses into the ocean—it might be more than a scientific curiosity. Indeed, it might be the kind of event that changes the course of civilization. In the part of the Thwaites Glacier where the cavity has been detected, the scientists have observed a “complex pattern of retreat and ice melt” with parts of the glacier retreating about 2,625 feet per year. 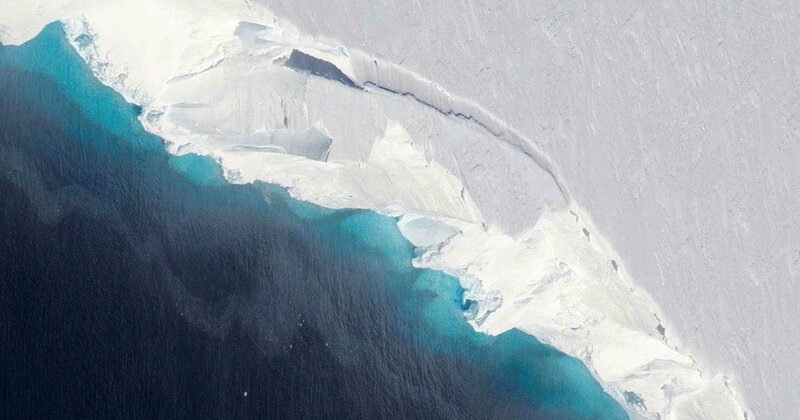 “Understanding the details of how the ocean melts away this glacier is essential to project its impact on sea level rise in the coming decades,” said Eric Rignot, a co-author of the NASA study.